Occurs after your first bounty or sale. This event is your first clue that something's not quite right in Misplaced Optimism. You'll be going about your business and all of the sudden your HUD starts flashing and you get a little movie of a strange ship checking you out and then crashing. There are Aliens on Titan and they can get you off Titan for good. Go to Light Well #3 in the Downtown Crater. I've never known the initial alien sighting to occur at any other spot. The quickest way I've found to get to the alien sighting is to begin the game as a Scavenger (or anything else that starts Downtown, like Dealer), kill the first pirate or trader I see, and head to Light Well #3. You can target Light Well #3 by targeting Police HQ or Police Garrison, flying toward them and then targeting Light Well #3 from the Local Services Menu. It's the Light Well nearest Police HQ. As you approach Police HQ and Light Well 3, start to target those around you with the 'y' key. You'll see that there are a lot of traders taking sheet metal and CompComp to Bargain Moths. Pirate one, especially one carrying the valuable CompComp. As soon as you begin scavenging their cargo, the alien sighting will occur if you're close enough to Light Well #3. Now take the pirated cargo to Bargain Moths and get the cash for yourself. Don't forget that you'll need to kill a crook or pay a fine to the police for your piracy. I suggest killing a crook. There's a guy named Zero Cool running around Downtown. Kill him for Police amnesty. 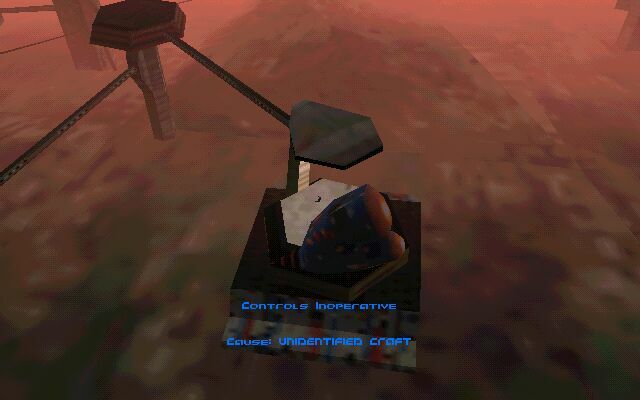 Screenshot of Alien Ship during the "Alien Sighting" event. Click the image above for a larger, more detailed view in a separate window. Make money!! You need a hangar, better Moth, better weapons. Making money should be your highest priority. The best way to do this is to give up trading and use a mix of piracy and bounty hunting. Make sure you have a Plasma Kannon, pod, and drone. I also like to go to a Software Shack and get Power Level 2. It tells you when your Cell is charging and is helpful in centering yourself in Light Wells. Go to a police station and target ten crooks and lock them in to your 'Pilot' menu. Now hang around the bars, trading posts, and moth dealers. Traders coming to these places have high-end goods to steal. Pirate a trader or two and then kill a crook to gain police clemency without having to pay a fine. If you run out of crooks locked in, try going to Haven and Midway and target any ship there. Just about every Moth that's not a faction or gang transport will be a pirate. The money will flow like water. Get a hangar. This will give you free repairs and you can open it to the public to sell repairs to others. A nice little money maker. Try to locate your hangar near a Light Well to increase your repair business. I like locating in the Downtown Crater so I'll have unhindered access to my hangar even when I'm on the bad side of a faction. This also gives you easier access to Psycho Bob's 1 which becomes important later on in the plot. You'll need around $17,000 to get a hangar. Get a better Moth. You may not have time to do this before the next mission, but start making the cash anyway. Trade in the Silver Y for a Hawk or Neo-Tiger. Remember you'll need to fit these new Moths with flares and software as well as your old Plasma Kannon, pod, and drone. Strip your Silver Y down before trading. Take off everything you can remove. Make sure you turn off your hangar's "Sales System" or someone may come in and buy your stuff at a big discount. You'll have a laser left over that you can sell at Psycho Bob's and buy flares with the money. You'll need $30,000-$40,000 before considering trading up for a better Moth. In all probability, the next mission will come up first.